Ready to get started on some free or cheap pallet projects? Once you have all of your pallets brought home get ready for some frustrating disassembly! 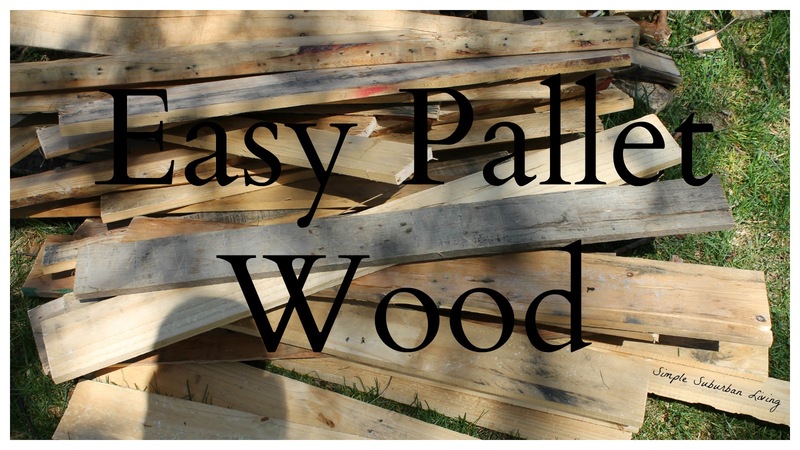 In this video I briefly discuss the method I have been using to take apart pallets to get useable wood. There are many other ways to do this very same thing but this has proved to be the quickest and easiest for me. The first step is to just lay out the pallets on a flat surface and start making cuts on the inside of the outermost supports. Using a jig saw or circular say is best and you can quickly have those outside supports removed from the pallet. As with any pallet project, make sure you check for nails ahead of any cuts! The next step is to use a Sawzall or reciprocating saw to free each slat from the middle support. I find this to the quickest way to get the most useable wood as long as you don't mind the nail head being left in the center of the board. Rock the slat back and forth to free up a small gap and slide the saw blade (metal cutting blade) between the slat and the support to cut the nails. If you prefer to pull the center nails just slide in a pry bar to pop the slats off and then pound out and pull those center nails. Either way works just as well but I prefer to pull less nails! Using this method you are left with a selection of 36"-39" slats that are ready to be used in any pallet project. Now if you are going to do more finishing on your final product like sanding or planning you obviously need to make sure to pull the center nails instead of cutting them with the Sawzall. There are many other options out there such as pallet pullers and special pry bars. My suggestions is to take the money you would spend on that specialized tool and get yourself a good wonder bar or used Sawzall instead. These tools can be used for much more than just pallets and are a necessity for any homeowner.